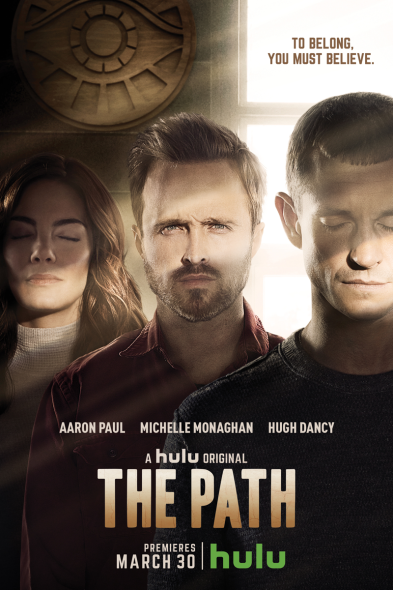 Online streaming outlet, Hulu, has released the season one key art for The Path TV series. Check it out, above. The first season of The Path consists of 10 one-hour episodes. This drama features a family embroiled in a controversial religious cult. The cast of The Path includes: Aaron Paul, Michelle Monaghan, Hugh Dancy, Rockmond Dunbar, Kyle Allen, Amy Forsyth, and Friday Night Lights’ Minka Kelly. As previously reported, The Path TV series is set to premiere on Hulu Wednesday, March 30, 2016. At the end of December 2015, Hulu released some more photos from the first season of Hulu’s The Path TV show. Get a look at the episodic images, here. In January, Hulu put out a new trailer for The Path. Watch it, here. Last month, Hulu released another official trailer for The Path. You can watch it, here. Go here, to get another exclusive look at The Path TV show, from Hulu. What do you think? How do you like the cast of The Path TV show? What do you think of The Path‘s premise? Do you plan to stream the series on Hulu? Please let us know, below, in the comments.